Even if the online world seems very appealing, the reality is that children will usually tend to find some unwanted and downright demanding situations for them most of the time. You have to realize that spending more time with your children and figuring out what they do online can really come in handy in keeping the safety in the cyberspace for your family. The more you get into this side of your child’s life, the better the results will be in the end. You have to understand that there are lots of situations when you get to deal with technology challenges, bullies and scammers that may end up attacking your child online. Either that, or you can have some other problems like identity theft or even some persons that want to do all in their power to make your child do unwanted things. At the end of the day, your primary concern has to be on value and on a very good quality. If you know how to handle all these things, the experience can indeed be some of the best out there. But do you know how to keep your family safe online? Most of us don’t know that at this point, but the infographic listed below can help. 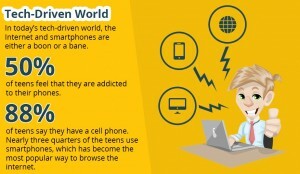 In this infographic, you will get to learn more about the challenges that your child can encounter online and many of the problems that you will face because of that as well. Study this infographic now and you will be able to understand why your child’s online safety is a major priority! How Much Screen Time is Right for Your Kids?